Alele Museum published a limited edition of First Day Stamped and Illustrated Envelops for collectors and philatelists with various illustrations and stamps series, about 70 different models, some of them accompanied with a description card. They are two different sizes of envelop, large are about 241mm x 105mm (about 9.5in. x4.1in. ), small are about 188mm x 100mm (about 7.4in. x 3.9in.). Illustrations on this website are for display only; the actual envelop you will receive may have small differences. Due to the limited edition of each First Day Cover, some model may not be available at the time or your order. Please inquire for actual availability. Themes include World War II, Life in the Marshall Islands, Planes, Space Crafts, United Nations, Fish, Butterflies, Children, Women, International VIP, Emperor Hirohito, Christmas, Sailing Vessels. 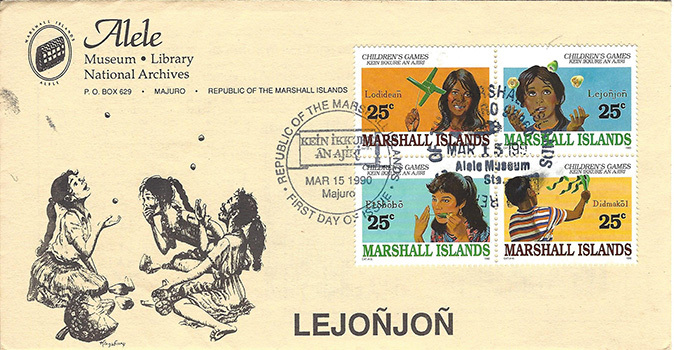 Alele Museum published a limited edition of First Day Stamped and Illustrated Envelops for collectors and philatelists. Various illustrations and stamps series, about 70 different models, some of them accompanied with a description card. Two different sizes of envelop, large are about 241mm x 105mm , small are about 188mm x 100mm. Illustrations on this website are for display only; the actual envelop you will receive may have small differences.